The day to reserve your spot will be Saturday, January 19, 2019, at the Winter Mini-Retreat or via the PayPal button (which will be activated that day)! ​The retreat will still be held in the beautiful Cascade Mountains at Camp Huston in Gold Bar, WA. Lodging is dormitory style, two or three to a room. We will have games, walks, prizes and lots of fun! teams of four. We did a crossword puzzle, a word search puzzle, decorated our wine glasses, and did a very challenging yarn identification game. Prizes were awarded, and on the last day, the winning team received gold medals! 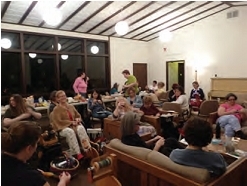 We included the quilters this year by asking them to come and judge our wine glass competition. By the end of the weekend, I think we had all gotten to know each other, which is the beauty of having a small retreat. I came home exhilarated and exhausted, with the firm belief that my fellow fiberholics are Really Good People. This year's retreat was another blast. Fun was had by all attendees. One of this year's hits was the game 'Last Knitter Standing', in which players, through a series of Challenges and Questions, 'Last Knitter Standing' will not only make you laugh, learn, and test your knitting knowledge, but will also tap into your competitive spirit. It was a lot of fun with food, wine and laughter. Be sure to look for the sign up for lottery spots for the 2012 Fall Retreat. We can assure you that fun and laughs will be on the agenda! The retreat was pretty laid back, it was a weekend of great food, and a whole lot of sitting around knitting. We had an organized wine tasting, but other than this we did not have any organized activities, everything was impromptu. 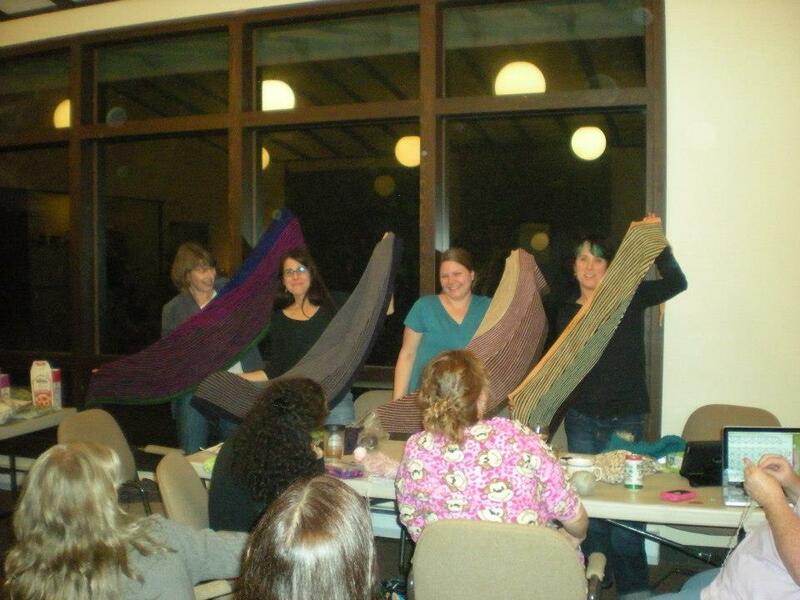 At one point we ended up going around the room and everyone shared what kind of knitting bag they had. In the evenings, we played a lot of games in small groups. It's a retreat, not a workshop, so it was very relaxed. Some people went hiking, some brought spinning wheels and spun, it was an unorganized, relaxed gathering. The best part about it was not having to cook, and having delicious meals prepared for us. I am looking forward to hopefully attending the retreat in October 2011.